A premium quality 3 x RCA phono wall plate with Red, White and Yellow gold plated solder connectors. Ideal for Left , Right Stereo sound and Video connections. This Audio Visual Stereo wall faceplate outlet is ideal for your left, right audio sound and Video. 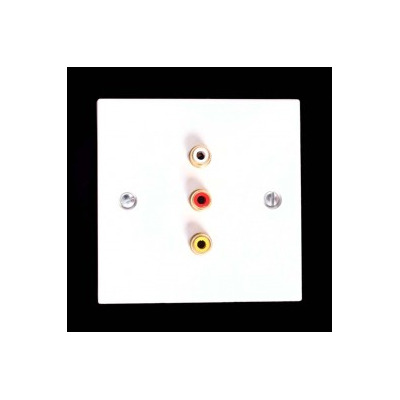 The Red, White and Yellow install plate has three female sockets presented on the front of the wall outlet and three gold plated solder connections on the rear. The 3 x RCA female audio faceplate is ideal for installing in your home, office or business room where you are looking to connect your audio visual device such as a television, LCD or plasma screen to another device such as a Xbox, Wii or Playstation gaming console or satellite receiver. Available in White or Black faceplate colour.